The DORITOS Commander in Chip Promotion is open only to legal United States residents, who are thirteen (13) years of age or older. The DORITOS Commander in Chip Promotion ends at 11:59:59 p.m. CT on October 28. Obtain a Bag Code. There are two (2) ways to obtain Bag Codes for the Instant-Win Cheese Flavored Tortilla Chips or DORITOS Cool Ranch Flavored Tortilla Chips and look for the unique 10-digit alphanumeric code located on the back panel of the bag. Purchase any 3.125 oz. or 10 oz. specially-marked bag of DORITOS Nacho Cheese Flavored Tortilla Chips or DORITOS Cool Ranch Flavored Tortilla Chips and look for the unique 10-digit alphanumeric code located on the back panel of the bag. 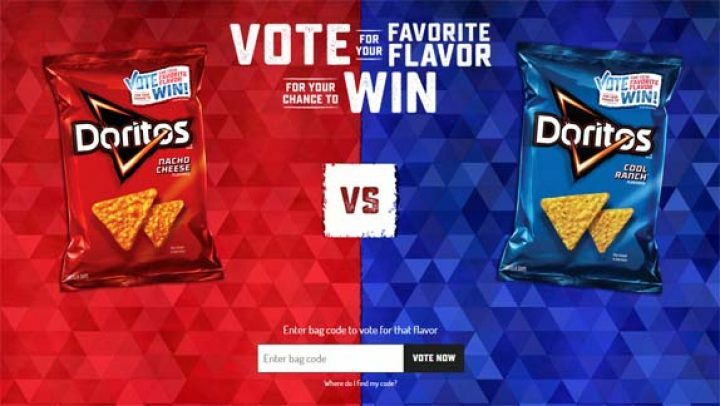 Go to DORITOS.com or doritosredvsblue.com and follow the instructions to enter a Bag Code and register for the Promotion. 1 / Las Vegas Presidential Package. / ARV: $10,000.00. Grand Prize consists of Air transportation to Las Vegas; double-occupancy hotel accommodations for two (2) nights in a Presidential suite; limousine service; and a four-year supply of DORITOS snacks awarded in the form of fifty-two (52) coupons for each year, each coupon good for one (1) bag of DORITOS brand product up to $4.29 each bag. Nacho Cheese Instant-Win Prizes: See Appendix A for prize breakout per Week. 900 / Red Cap. / ARV: $9.99 each. 908 / Red Classic Mug. / ARV: $4.99 each. 900 / Nacho Cheese Can Cooler. / ARV: $3.00 each. 1,400 / Nacho Cheese T-shirt, size Large. / ARV: $9.99 each. 10 / Nacho Cheese Starter Jacket, size Large. / ARV: $99.99 each. 100 / $10.00 Red Box Gift Card (subject to terms and conditions as set by issuer). / ARV: $10.00 each. 2 / $500.00 Virgin Airlines voucher (subject to terms and conditions as set by issuer). / ARV: $500.00 each. 2 / YouTube Red Subscription for one (1) year (subject to terms and conditions as set by issuer). / ARV: $120.00 each. 1 / Dune buggy experience in desert. / ARV: $3,700.00. “Dune buggy experience in desert” Prize consists of Air transportation to Las Vegas; double-occupancy hotel accommodations for two (2) nights; a dune buggy experience for winner and winner’s guest; and $300 spending money. 1 / Hot Springs Trip. / ARV: $1,300.00. “Hot Springs Trip” Prize consists of Air transportation to Hot Springs, Arkansas; double-occupancy hotel accommodations for two (2) nights; two (2) tickets to a Thermal Pool; and $300 spending money. 1 / Desert Hot Springs Trip. / ARV: $3,000.00. “Desert Hot Springs Trip” Prize consists of Air transportation to Palm Springs, California; double-occupancy hotel accommodations for two (2) nights in or near Desert Hot Springs, California; $300 credit (total) for spa treatments for winner and guest ($150 each); and $300 spending money. 1 / Marfa Desert Trip. / ARV: $2,300.00. “Marfa Desert Trip” Prize consists of Air transportation to El Paso, Texas; double-occupancy hotel accommodations for two (2) nights in Marfa, Texas; and $600 spending money. 1 / Grand Canyon Hiking Tour. / ARV: ARV: $2,000.00. “Grand Canyon Hiking Tour” Prize consists of Air transportation to Flagstaff, Arizona; double-occupancy hotel accommodations for two (2) nights in Grand Canyon National Park; guided hike in the Grand Canyon for winner and winner’s guest; and $300 spending money. 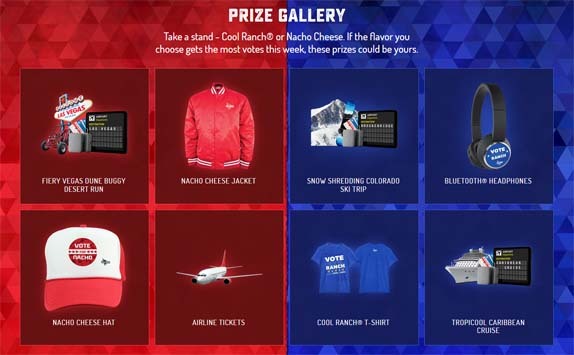 Cool Ranch Instant-Win Prizes: See Appendix A for prize breakout per Week. 900 / Blue Cap. / ARV: $9.99 each. 908 / Blue Classic Mug. / ARV: $4.99 each. 900 / Cool Ranch® Can Cooler. / ARV: $3.00 each. 1,400 / Cool Ranch T-shirt, size Large. / ARV: $9.99 each. 10 / Cool Ranch Starter Jacket, size Large. / ARV: $99.99 each. 10 / Bluetooth Speaker. / ARV: $39.99 each. 10 / Bluetooth Headphones. / ARV: $49.99 each. 2 / $500.00 Jet Blue Airline Voucher (subject to terms and conditions as set by issuer). / ARV: $500.00 each. “Trip to a Ranch” Prize consists of Air transportation to Denver, Colorado; double-occupancy hotel accommodations for three (3) nights in Sundance, Colorado; horseback riding for winner and winner’s guest; and $600 spending money. 1 / Ski Trip / ARV: $3,700.00. “Ski Trip” Prize consists of Air transportation to Denver, Colorado; double-occupancy hotel accommodations for two (2) nights in Breckenridge, Colorado; two (2) one-day lift tickets for winner and winner’s guest; and $300 spending money. 1 / Cruise / ARV: $4,500.00. “Cruise” Prize consists of Air transportation to Orlando, Florida; a four (4) day/three (3) night cruise for winner and winner’s guest on Royal Caribbean ship. Winner and guest will stay in one (1) room while on aboard the ship. Room location to be determined by Sponsor, in Sponsor’s sole discretion. Winner will receive $600 spending money. 1 / Trip to Iceland / ARV: $4,900.00. “Trip to Iceland” Prize consists of Air transportation to Reykjavik, Iceland; double-occupancy hotel accommodations for three (3) nights in Reykjavik, Iceland; and $300 spending money. Jumpin’ Jack Random Drawing Prizes: See Appendix A for prize breakout per Week. 100 / Red Cap. / ARV: $9.99 each. 100 / Red Classic Mug. / ARV: $4.99 each. 100 / Can Cooler. / ARV: $3.00 each. 100 / Nacho Cheese T-shirt, size Large. / ARV: $9.99 each. 100 / Blue Cap. / ARV: $9.99 each. 100 / Blue Classic Mug. / ARV: $4.99 each. 100 / Blue Can Cooler. / ARV: $3.00 each. 100 / Cool Ranch T-shirt, size Large. / ARV: $9.99 each. For all prizes: Winner must accept prize as stated by Sponsor or prize may be forfeited. Any difference between stated value and actual value will not be awarded. Total ARV of all prizes is $100,849.44. Prize limits are as follows: Limit five (5) prizes with an ARV between $0.99 and $9.99 per person/household. Limit one (1) prize with an ARV between $10.00 and $100.00 per person/household. Limit one (1) prize with an ARV over $100.00 per person/household.